Just how much water levels have risen in the last week can be seen in this split image of the area behind Shirnall Meadows. The right side of the image was taken on the 1st February and the left, today (Saturday 8th). 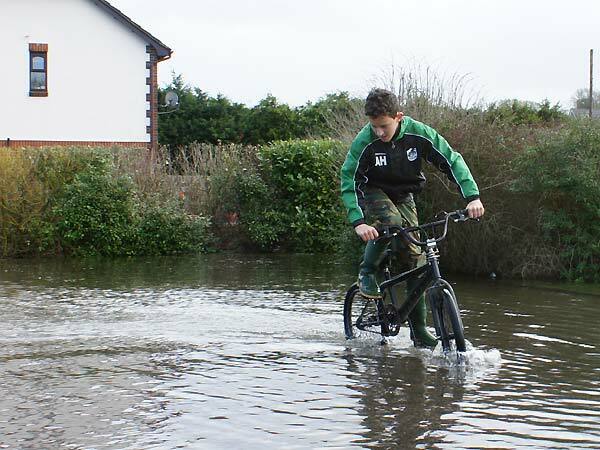 This has spilled over and flooded a short stretch of the A32, Gosport Road, to the south of Street House Farm. The situation is made far worse by the excessive speed of some vehicles driving through the floodwater on the main road. While the majority of drivers are driving sensibly, quite a number seem to be totally ignorant, or simply don't care, what damage they are causing by driving too fast. 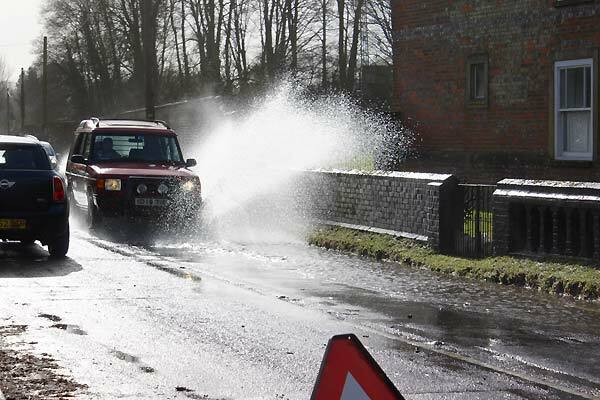 The result is a wave of water which sprays into the front of roadside houses and a bow wave washing large volumes of water into gateways and houses along the A32. 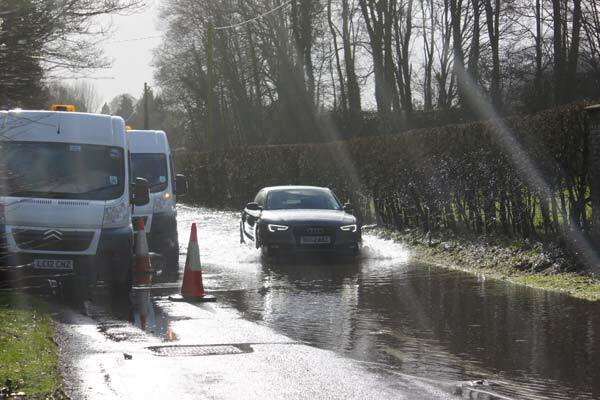 After yet another deluge, water was also flooding across the A32 by the Golden Pheasant through Friday night and Saturday morning, but eventually drained away after local residents cleared the gratings on the roadside drains. Thanks to requests from the Parish Council and residents, the highways authority has also been in action in the area, supplying sandbags and pumps and doing what they can to ensure the drains are clear.The vehicles here were parked by The Cottage, which is one of the houses particularly vulnerable to waves of water washing into drive from passing traffic. Fortunately this driver is rather more considerate than the one in the previous image. So far, the extra drains installed after the 2001-2001 have kept the levels in the central part of Farringdon below the point at which it floods across the Gosport Road crossroads, but with more rain forecast in the next few days and no immediate respite in sight, many Farringdon residents will be keeping a wary eye on the water levels on the old Chase Field site. As long as the storm drains can keep pace with the flow of water into Farringdon from the South, through the lavant stream, all will be well. But, if flow rates increase beyond that level the situation becomes critical, as this will cause water level to rise up to to a point where it can escape by flowing down the Gosport road into the fields on the northern boundary of the Village. 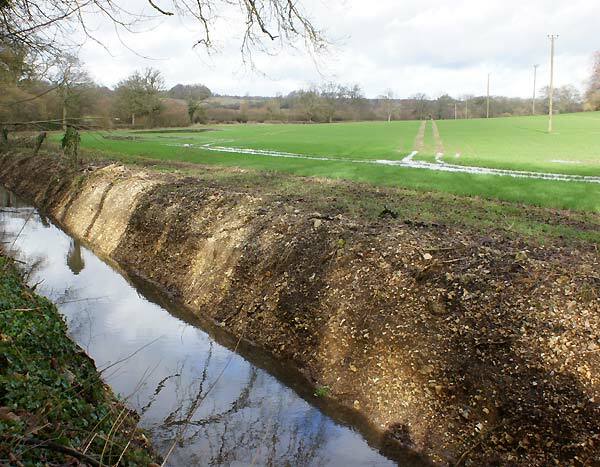 This could also create a problem for our neighbours in Chawton as the only way flood water can flow into the River Wey is through the southern side of Chawton Village. 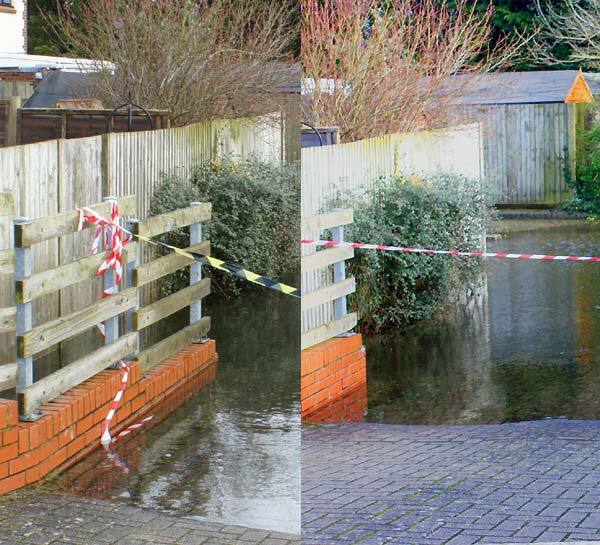 Once again the images above show how water levels have risen in the last week and remember, most of this water is coming up through the ground from the underground water course, fed from water seeping through the ground into the lavant stream. The rate of flow is determined by water falling on the ground some weeks before, so even when the rain stops, which it surely must do eventually, it will be some weeks before the flow begins to drop to a level where water can escape without breaking through to the surface. 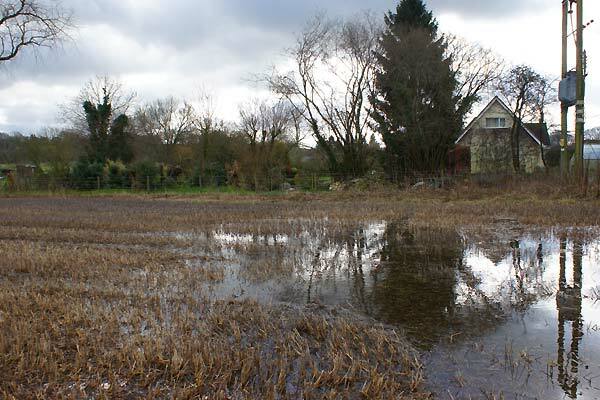 Gardens behind the terraces and houses on the east side of the A32 have also been flooded, as is the lower end of Parsonage, the field that runs alongside New Road. I'm sure all Farringdon residents will hope that the situation will not get any worse over the coming days. Eventually everything flowing out of Farringdon ends up in the ditch and fields on the east side of the A32, which on the other side of the hedge in the left background of this image. Don't be misled by this picture, the level in the ditch is limited by the rate water can flow through the culverts on the upstream side, from Farringdon, behind which water is rising almost to bank level. As can be seen here quite a lot of water is flowing through the fields, but whether via ditch or field, all of it is heading towards Chawton, via Church meadow and on through the low ground on the eastern side of the Village. On a lighter note, and one is certainly needed, at least the younger generation were determined to make the best of the conditions in the car park!